Today, some Daily Photo members will be posting pictures of places in their cities that resemble other DP cities. I couldn't for the life of me find somewhere in K.L. (unless I drove out of the city and a Japanese restaurant would be too obvious.) 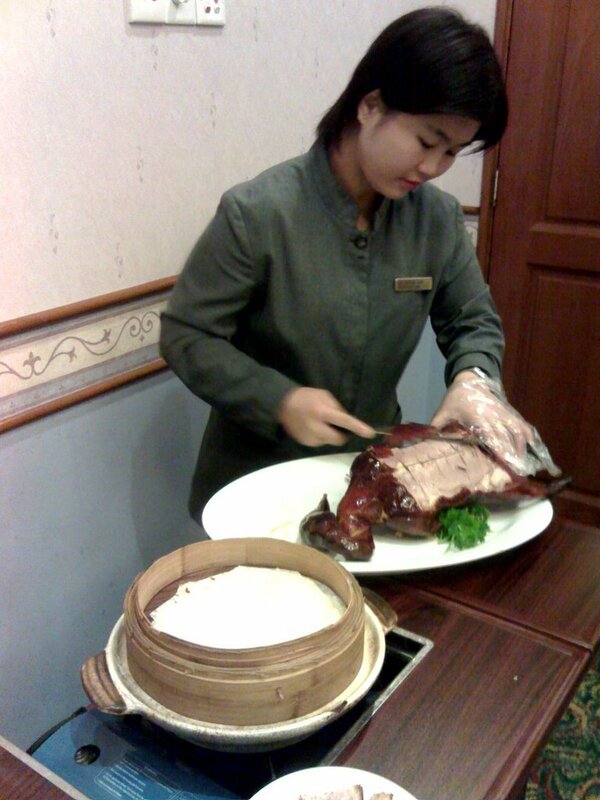 So, when I went for a birthday dinner last night, I took a picture of this succulent Peking Duck. Why? Because it reminds me of London where the best Chinese restaurants are. Anyone who has ever dined in Royal China or Four Seasons in Bayswater would agree. I think I prefer to be on the OTHER side of the kitchen eating, versus slicing. I'm sure it was good though! so my ducks came here ,eh !